Working on those pages, and believe me - it's going to take time. Superorder: Anseriformes Worldwide; 150 species. float on the water surface, and in some cases dive in at least shallow water.The family contains around 146 species in 40 genera. They are generally herbivorous, and are monogamous breeders. A number of species undertake annual migrations. A few species have been domesticated for agriculture, and many others are hunted for food and recreation. Five species have become extinct since 1600, and many more are threatened with extinction. Genus:Mergus, mergansers (5 living species, one extinct). shelducks or to the dabbling ducks. See also the monotypic subfamilies above, and the "perching ducks"
Genus: Coscoroba, Coscoroba Swan  Anserinae or same subfamily as Cereopsis? Genus:Cereopsis, Cape Barren Goose  Anserinae, Tadorninae, or own subfamily? Genus:Malacorhynchus, Pink-eared ducks (1 living species)  Tadorninae, Oxyurinae or Dendrocheninae? Genus:Sarkidiornis, Comb Duck  Tadorninae or closer to dabbling ducks? Genus:Tachyeres, steamer ducks (4 species)  Tadorninae or closer to dabbling ducks? Genus:Cyanochen, Blue-winged Goose  Tadorninae or more distant clade? Genus:Nettapus, pygmy geese (3 species)  Anatinae or part of Southern Hemisphere radiation? 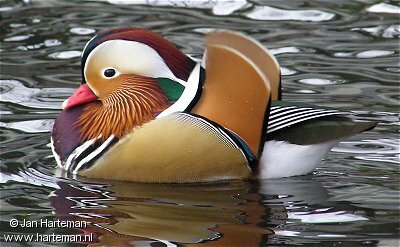 Genus:Aix, Mandarin Duck and Wood Duck (2 species)  dabbling ducks or Tadorninae? Genus:Callonetta, Ringed Teal  dabbling ducks or Tadorninae? Genus:Chenonetta, Maned Duck (1 living species)  dabbling ducks or Tadorninae? Includes Euryanas. sea when migrating and in winter. This order contains only a single family, the Podicipedidae, containing 22 species in 6 extant genera. run for a short distance, they are prone to falling over, since they have their feet placed far back on the body. Grebes have narrow wings, and some species are reluctant to fly; indeed, two South American species are completely flightless. from the Least Grebe, at 120 grams and 23.5 cm, to the Great Grebe, at 1.7 kg and 71 cm . The following grebes are shown on three different pages. The diving ducks, commonly called pochards or scaups, are a category of duck which feed by diving beneath the surface of the water. They are part of the diverse and very large Anatidae family that includes ducks, geese, and swans. their subfamily, Merginae is a very distinct one however. to dive, and feed more like dabbling ducks. their legs tend to be placed further back on their bodies to help propel them when underwater. A diving duck which eats seeds, roots, aquatic plants and grasses as well as invertebrates and small fish. Pochards may also be seen filtering mud on the shoreline. It is found North of the equator from Iceland and western Europe to central Asia and sw Siberia and western Yakutia. South of this the range covers Spain and then east through France, Tunisia the Balkans to Kazakhstan and ne China. Winters farther south in the tropics. species in ten extant genera. All but two of the 20 species in this group occupy habitats in far northern latitudes. developed specialized salt glands to allow them to tolerate salt water, but these have not yet developed in young birds. Some of the mergansers prefer riverine habitats. Genus Mergus, the typical mergansers. often termed Mergus cucullatus, is not of this genus but closely related. The other "aberrant" merganser, the Smew, Mergellus albellus, is phylogenetically closer to goldeneyes, Bucephala. uniquely among all Anseriformes, they do not have notches at the hind margin of their sternum, but holes surrounded by bone. major part of the world. have a more limited display. feathers that function as rudders in underwater swimming, at which all species are very adept. These species also have a dense and shiny body plumage much like that of grebes, but lack metallic coloration altogether. or special air sacs. All species have large feet and their legs are placed well toward the rear, which results in a poor walking ability. Thalassornis leuconotus Hvitryggand White-backed Duck ? highly apomorphic lineage derived from the dabbling ducks. more appropriately reflects the remaining uncertainty about the interrelationships of the major lineages of Anatidae (waterfowl). Blue-winged ducks/shovelers and allies (polyphyletic? The pygmy geese are a group of very small "perching ducks" in the genus Nettapus which breed in the Old World tropics. They are the smallest of all wildfowl. As the "perching ducks" are a paraphyletic group, they need to be placed elsewhere. The initially assumed relationship with the dabbling duck subfamily Anatinae has been questioned. northern Australia and southern New Guinea. African Pygmy-goose, Nettapus auritus, No: Praktdvergand sub-Saharan Africa. Their habitat is still freshwater lakes, where these neat ducks feed on seeds and other vegetation, especially water lilies. Pygmy geese have short bills, rounded heads and short legs. They nest in tree holes. Anas is a genus of dabbling ducks. It includes mallards, wigeons, teals, pintails and shovelers in a number of subgenera. Some authorities prefer to elevate the subgenera to genus rank. Pacific clade  the moa-nalos might be derived from this group. Probable genus Spatula  blue-winged ducks/shovelers and allies (polyphyletic? Teal (english) is a medium bluegreen colour-. The name comes from the Eurasian Teal, which has that colour around its eyes. duck-like waterfowl such as the geese and swans. Ruddy Shelduck breeding in northern temperate regions, though the Crested Shelduck was also a northern species. Most of these species have a distinctive plumage, but there is no pattern as to whether the sexes are alike, even within a single genus. Genus Salvadorina: (New Guinea) - formerly in Anatidae and "perching ducks"
Genus Hymenolaimus: (New Zealand) - formerly in "perching ducks"
Genus Merganetta: (Andes mountains, South America) - formerly in "perching ducks"
the biological family that includes the ducks and most duck-like waterfowl such as the geese and swans. geese (Anserinae) and ducks. They are mid-sized (some 5060 cm) Old World waterfowl. are white. Their diet consists of small shore animals (winkles, crabs etc.) as well as grasses and other plants. They were originally known as "sheldrakes", this remained the most common name until the late 19th century. The word is still sometimes used to refer to a male shelduck and can also occasionally refer to the Canvasback (Aythya valisineria) of North America. and all except the Flying Steamer Duck are flightless; even this one species capable of flight rarely takes to the air. The genus name Tachyeres, "having fast oars" or "fast rower", comes from Ancient Greek "fast" + "I row (as with oars)". The common name "steamer ducks" derives because, when swimming fast, they flap their wings into the water as well as using their feet, creating an effect like a paddle steamer. They are usually placed in the shelduck subfamily Tadorninae, but DNA analyses indicate they rather belongs into a distinct clade of aberrant South American dabbling ducks, which also includes the Brazilian, the Crested, and the Bronze-winged Ducks. Sheldgoose, alle innen en andestamme i gruppen Tadornini, (se Gravand), famailien Anatidae (orden Anseriformes). De mindre medlemmer av stammen kalles shelducks. Sheldgeese finnes i tropiske og subtropiske regioner verden over. De er små-nebbet og heller langbented, med opprist holdning, none har benete sporer - som fungerer som våpen - ved vingene. De er ikke virkelige gjess, selv om de ligner dem i noen anatomiske deler. The whistling ducks or tree ducks are a subfamily, Dendrocygninae of the duck, goose and swan family of birds, Anatidae. In other taxonomical approaches, they are either considered a separate family "Dendrocygnidae", or a tribe "Dendrocygnini"
in the goose subfamily Anserinae. tropics and subtropics. These ducks have, as their name implies, distinctive whistling calls. The whistling ducks have long legs and necks, and are very gregarious, flying to and from night-time roosts in large flocks. Both sexes have the same plumage, and all have a hunched appearance and black underwings in flight.